Stop for a moment! Here’s something else to consider. What about all your stated beliefs? 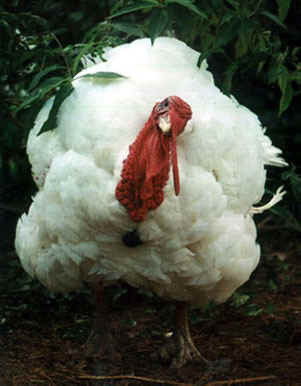 In the land of the free, shouldn’t an innocent, harmless, loving creature like me and all my turkey friends roam free? In a country that prides itself on justice for all, shouldn’t I be one of the ones to whom you show fairness? I’d never chop your head off just to satisfy my appetite and give thanks. May I count on you for mutual mercy? They say tragedies make you stronger and wiser. But getting your head chopped off for nothing? What do you learn from that? Hey, maybe, just maybe, even if it won’t help me or my kind now, maybe it will help me help the world in my next life. Maybe I’ll be reborn as a human being and no longer be a turkey – but still remember my unwarranted fate as an innocent bird and my grief because of it. Maybe, just maybe, I’ll use my first life and its horrible ending as a guide to why and how to love all of nature and all creatures, including turkeys, and not hurt any living thing simply for pleasure. But in this life I’m still trapped in? Oh, my God, what can I do? This is supposed to be a great time of year. Oh, yeah? Try telling any turkey that! Oh, no! Here and now, people are coming after me and my friends and relatives. Help! I’m too young to die! What did I ever do to you to deserve such punishment? I’m not a perfect being I’ll admit. But do I deserve to die so young just for being a bird? Do you realize if you were one of us turkeys, you'd be crying your eyes out? I am not a criminal: I didn't rob a bank, commit fraud, or set off a bomb. The only act of terror you can charge me with is my own terror of being a turkey, and of being executed for a crime I didn't commit! Where is your sense of justice? Would you think it was fun if someone killed you just to get a meal when there is so much else to eat? Is this how you show your Thanksgiving gratitude – by slaughtering the innocent? C’mon, think about it! There are so many better ways to show gratitude than by killing me and my kind! Think now, you humans! You supposedly have good brains, and most of you claim to have good hearts, so tell me honestly, do you think the only way you can enjoy Thanksgiving is to kill, Kill, KILL? C’mon, folks, there are kinder ways of showing thanks than chopping and stuffing and chewing to bits creatures like me. Please, all of you out there, consider these facts: We're all struggling to keep hope alive so I beg you to understand that I too need hope, and so do my friends and relatives who are turkeys. It's pretty scary if all we have to look forward to – before you kill us – is a momentary happiness tinged with dread. How would you feel if this were your lot in life? Surely, you can see the hardship you're imposing with your slaughter of our kind every year. Elsie Reimenschneider is the mother of Sophia and Jenny Reimenschneider, who along with friends promote veganism through their volunteer organization, Mobilization for Animals, located in and around Philadelphia, Pennsylvania.